Last year, I came across a new brokerage firm called Betterment that promotes hands-off, passive investing with ETFs. Despite that being right up my alley, I didn’t write about Betterment at the time because I thought their costs (0.3%-0.9% per year) were just too high. Recently, however, they dramatically reduced their costs (details below), so I thought it would make sense to take another look to see if they might be a good fit for any particular types of investors. In short, Betterment creates an ETF portfolio for you based on your risk tolerance, and they rebalance it quarterly as well as any time the account’s allocation strays more than 5% from the desired allocation. There’s no fee for the rebalancing transactions or for putting money into or taking money out of the account. 0.15% per year for investors with more than $100,000. Based on those funds’ expense ratios, an investor’s annual costs before considering Betterment’s fee would be approximately 0.17%. Once you add in Betterment’s fee, we’d be looking at all-in costs of either ~0.42% or ~0.32%, depending on whether you have more or less than $10,000 invested with them. Costs that are much lower than industry averages, but still higher than what you’d pay for a LifeStrategy or Target Retirement fund at Vanguard. For most investors at this asset level desiring a hands-off solution, I would still suggest using an all-in-one fund from Vanguard — with the exception being investors who prefer Betterment’s allocation strongly enough to pay an extra quarter of a percent for it per year. For investors with no choice but to own bonds in a taxable account, it could be a way to create an all-in-one fund that uses tax-exempt bonds. For investors looking to tilt heavily toward REITs or small/cap value stocks, it could be a way to do that. For investors looking to have a very high or very low international allocation, it could be a way to do that. I’m very excited about what Betterment is doing. I think it’s wonderful to have more firms in the marketplace that encourage the use of a “buy, hold, and rebalance” strategy using a diversified portfolio of low-cost funds. At the same time, I think Vanguard is already doing a great job of meeting most investors’ needs, and they’re doing it at a lower cost. …I think Betterment’s offering is worth looking into. In my opinion, Social Security and Medicare are likely to be around for many years to come. Still, I think it is rational for people under 30 to acknowledge that the benefits will probably be reduced, kick in at a later age, and be means tested to the hilt — thereby making it more important than ever for young people to start saving for retirement as early as they can. Would you consider writing an article about the benefits of starting in your 20s rather than putting it off? I know there has been a fair amount written about this subject, but there can never be enough information about the power of compounding investments — especially at an early age. It is quite beneficial to start saving early. But I find that most articles making the case for doing so are a bit unfair to their readers because they use unrealistically rosy figures in their math. For instance, I recently came across a blog post in which the writer calculated the wealth accumulated by age 65 for an investor who makes a $5,000 contribution to a Roth IRA every year. The author used a historical stock return figure of 9.8%, showing that if the investor starts at age 22, he accumulates more than $3.3 million. By waiting until age 35, however, that number is reduced to approximately $960,000. The message was essentially that you can be filthy rich if you start investing as soon as you finish school. But there are two major problems with that analysis. First, it uses nominal return figures rather than inflation-adjusted figures. Because we’re talking about a period of time that spans more than four decades, this error makes the resulting figure (the wealth built by age 65) look much larger than it really is — more than 3.5-times as large, in fact, if inflation averages 3%. Most investors don’t (and shouldn’t) use a 100%-stock portfolio. And with interest rates as low as they are, bond returns going forward are likely to be far lower than historical U.S. stock returns. I appreciate the motivation behind such articles — it is important to get young people investing early. But what happens if we substitute more realistic return figures? The following table shows the inflation-adjusted wealth an investor would accumulate by age 65 if she invested $5,000 per year (starting at either age 22 or 35) and earned real returns of 3-5% per year. So, yes, there’s still a large benefit to starting early. In fact, one could argue that low return expectations make it even more important to start early. But these numbers don’t exactly strike the, “you could be rich!” chord, which is typically what such articles attempt to do. If anything, with realistic return numbers, the appeal would more likely be to fear. It’s hard to retire on $300,000 unless you have a pension (or a part-time job) or are willing to rely on Social Security benefits for the majority of your income. From time to time, I hear from investors who have made mistakes relating to the rollover of a 401(k) or other employer-sponsored plan. Unfortunately, many such mistakes are not reversible, so it’s best to be aware of them so you can steer clear. Your 401(k) includes appreciated employer stock and you want to take advantage of the “net unrealized appreciation” rules. If you’re planning to execute a Roth conversion in the near future from a traditional IRA that included nondeductible contributions (or if you’ve already executed such a conversion this year), you might want to wait until the year after the conversion to roll over your 401(k). When calculating the percentage of a Roth conversion that is not taxable, the denominator of the fraction includes your traditional IRA balance as of 12/31 of the year in which the conversion takes place. In other words, by rolling over a 401(k) in that same year, you increase the amount of the conversion that would be taxable as income. It’s not common, but I have heard from a few investors whose 401(k) rollovers have failed completely because they didn’t play by the rules. You see, when executing a 401(k) rollover, you only have 60 days from the date you receive the money to get it deposited into your traditional IRA or your new employer-sponsored plan. If you fail to get the money moved before those 60 days expire, the entire amount counts as a distribution — meaning that it will be taxable and likely subject to a 10% penalty, and you will have lost your chance to get it into an IRA to take advantage of tax-deferred growth in the future. Related note #1: When executing a direct trustee-to-trustee transfer (in which the money is moved directly from one custodian to another) as opposed to a rollover (in which the check is made out and sent to you), you do not have to worry about this 60-day limit. This mistake is similar to the one above in that it results in a failed transfer, the loss of tax-deferred status, and (often) a whopping tax bill. When you inherit an IRA, unless you’re the spouse of the deceased owner, you can not roll the money over into your own IRA. You can, however, have the money moved to another custodian (i.e., brokerage firm or fund company). But you have to be very careful about how you do it. Specifically, the transfer must be a direct trustee-to-trustee transfer, and the IRA at the new custodian must be properly titled in the name of the deceased owner of the original IRA, with you named as the beneficiary. Your best bet here is to call the new custodian, tell them what you want to do, and have them walk you through the process step by step. Finally, the most common mistake I see is simply rolling your 401(k) over to the wrong place. When switching jobs, many investors roll their old 401(k) into their new 401(k) without bothering to check the costs in the new plan. In many cases, it would have been better to roll the 401(k) into an IRA at a low-cost brokerage firm or fund company. Growth Stocks or Value Stocks for Young Investors? First, we need to back up a step. When categorizing investments, “growth” can mean either of two different things. I suspect this is what your source meant with his/her suggestion that young investors should allocate a large part of their portfolios to growth investments. But, as it turns out, this growth-as-opposed-to-income characteristic is not exactly what the “growth” in Vanguard’s index fund and ETF names refers to. Fund companies can name their funds almost anything they want, but with regard to Vanguard’s index funds (and with regard to Morningstar’s classification system), when something says “growth,” that’s as opposed to “value.” And it refers to the fact that the fund owns primarily growth stocks instead of value stocks. Growth stocks are those of companies whose profits are expected to grow more quickly than average. And value stocks are those of companies whose profits are expected to grow more slowly than average. But the fact that growth companies are expected to grow more quickly than value companies does not mean that growth stocks are expected to earn higher returns than value stocks. This is because the higher-than-average expected growth in profits is already built into the price of growth stocks. A growth stock will generally only have above-average returns if the company’s profits grow more quickly than expected. For example, Vanguard Small-Cap Growth Index Fund does not have higher expected returns than Vanguard Small-Cap Index Fund or Vanguard Small-Cap Value Index Fund. And Vanguard Growth Index Fund’s expected returns are no higher than those of Vanguard’s Total Stock Market Index Fund. So, for a young investor, it’s possible that personal circumstances would make a tilt toward growth stocks advantageous. (For example, if you had reason to think that your job safety had an unusually strong correlation to value stock returns, you might want to tilt your portfolio away from them and toward growth stocks so as to reduce the likelihood of your portfolio crashing at the same time that you get laid off.) But such cases are not common. And a desire to increase the risk and expected return of your portfolio is not really a good reason to tilt toward growth stocks. Investing Blog Roundup: Can I Retire Yet? In addition to the above find, there was an abundance of enjoyable investing-related articles this week. I hope you find some of them helpful. “2011 was my first year with a full-time job, and I’m attempting to prepare my tax return on my own. The form instructions are better than I’d expected, but I still have several questions. Instead of emailing you or somebody else with every single question, I’d prefer learn how to find this stuff on my own. In my experience, the key to finding answers to tax questions is, naturally, to use Google. More specifically though, the key is to use Google to search a specific site. This can be done by adding “site:whateversiteyouwanttosearch.com” to any query. Additional tip: If you’re looking at a particularly lengthy document and struggling to find the applicable material, you can simultaneously hit the control and F keys (command + F for Mac OS) to search the document for a specific word or phrase. It’s important to remember, however, that most documents on the IRS website (including IRS publications) don’t actually count as legal authority. Granted, the IRS is a credible source, so you can usually count on them to be correct, but if you want to be absolutely sure, the place to look is the actual Internal Revenue Code. The place I always look when I want to read an IRC section is Cornell University’s website. But again, the site’s search function leaves much to be desired. And doing a Google search with “site:cornell.edu” isn’t much better because, as you’d expect, Cornell’s site includes a vast array of pages other than those on which the IRC is published. 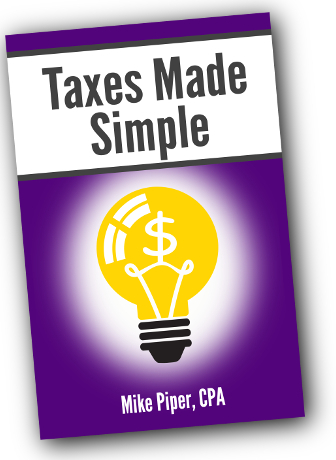 "Very easy to read and is a perfect introduction for learning how to do your own taxes. Mike Piper does an excellent job of demystifying complex tax sections and he presents them in an enjoyable and easy to understand way. Highly recommended!"